A Commis Chef working in a hotel kitchen was walking past a deep fat fryer carrying a box of potato peelings when his foot slipped from under him, as he reached out to steady himself he plunged his arm into hot oil. 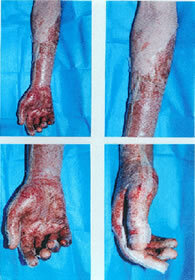 He sustained full thickness burns to his hand and arm and further burns to his face due to the oil splashing onto him. As a result he underwent surgery and was off work for almost five months. At the time of the accident he had been wearing steel toe-capped chef boots. An investigation by the Environmental Health Officer (EHO) found that there had been problems on a daily basis with water pooling on the floor around the dishwasher, vegetable preparation area and steamers. The employer said that they were due to leaks and mis-operation of the dishwasher by staff. The company had a slip and trips risk assessment and also undertook monthly checks. These indicated that the condition of the floor and its resistance to slips was poor and mentioned the presence of water on the floor. But despite these checks and staff complaints effective solutions were not implemented. The inspector concluded that there had been a continuing problem with water on the floor both before and after the accident, it presented a serious slipping hazard and this issue had never been properly addressed, this led to the decision to prosecute. The company were charged with failing to undertake a suitable risk assessment and put in place a safe system of work. The company pleaded guilty, were fined £14,000 and had to pay costs of £2,000. Since the incident the company have made several improvements; A clean as you go policy has been set up; the floor has been replaced with one that will remain slip resistant when wet (at a cost of £26,000); risk assessments are now reviewed twice a month and results reported back to management; The reporting system has been reviewed.